I found this recipe at Whole Foods. It was displayed somewhere, and I slipped it into my purse because it looked good. I haven't always been a huge curry fan to be honest. But one day some friends from work, aka the plantation, said I should try Taj Mahal, the Indian lunch buffet with them, and I decided I loved Indian food and all curries moving forward. I learned at Barnes & Noble that curries come from all over - from India to Africa to Thailand. The frst time I opened the Thai green curry paste, the first thing it reminded me of was my mom's venison. She always marinated it in tons of herbs, including lemongrass, ginger, shallots, and garlic. And that, my friends, is exactly what is in this green curry paste. I am so glad I found this recipe! Thank you Whole Foods! And Mom, make me a huge jar of this stuff! Indian, Thai, and Vietnamese food all have so much in common. You can't cook any food from these regions without a minimum of 3 or 4 or 5 different ingredients to create the kaleidoscope of flavors that lead to unforgettable moments on your tastebuds. I found all of the exotic ingredients for this dish either at Whole Foods or at the Kroger Marketplace on Chenal in the international aisle. Green curry paste and coconut milk make a flavorful base for this curry featuring chicken, green beans and basil. This recipe was inspired by Whole Planet Foundation microcredit clients. Heat oil in a large high-sided skillet over medium-high heat until hot but not smoking. Add curry paste and 1 1/4 cups coconut milk and whisk constantly until smooth. Bring to a boil, stirring to prevent scorching. Add chicken and green beans and return to a boil. Cook about 8 minutes or until chicken is cooked through and green beans are tender, stirring frequently. Meanwhile, prepare rice noodles according to package instructions. Add remaining 1/2 cup coconut milk to skillet and return to a boil. Stir in fish sauce, sugar and basil leaves and remove from heat. 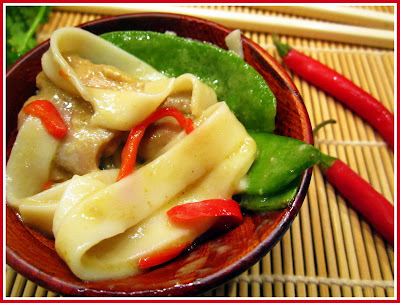 Serve over rice noodles, garnished with chiles, if you like.